Title: The Evolutionary Sequence in Tragedy and the Bible Author: Leonard Moss Imprint: The Davies Group, Publishers soft cover 232 pp. 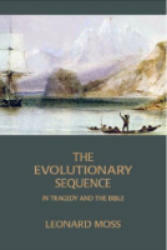 USD 24.00 ISBN 978-1934542040 February 2009 Of the many available books that celebrate the Bible, Shakespeare, and Charles Darwin, The Evolutionary Sequence is the first study to show their continuity. The technical details of literary practice—narrative patterns, sentence constructions, and metaphorical designs—project a paradox informing natural selection. In order to flourish, both nature’s organisms and civilization’s actors require stability; at crucial times they also require flexibility. They must preserve existing bonds or boundaries and simultaneously adjust to environmental and social stress. The welfare of a species, or a character representing some traditional mode of conduct, depends on the resolution of a contest between constancy and deviation. Moss shows how Darwin’s observations in The Origin of Species on natural variation, adaptation, and selection are relevant to the unfolding of ethical and religious values in dramatic and biblical landmarks, such as The Hebrew Torah and the Books of Ecclesiastes, Job, and Matthew, as well as plays by Shakespeare, O’Neill, and Beckett, that display an evolutionary sequence shaping belief systems as well as organic structures. Contents Acknowledgments Introduction Chapter 1. The Evolutionary Sequence Chapter 2. The Darwinian Covenant Chapter 3. Two Hebrew Skeptics Chapter 4. Jesus the Adapter Chapter 5. The Tragic Impasse: Shakespearean Constancy and Deviation Chapter 6. Darwin’s Paradox and O’Neill’s Long Day’s Journey into Night Chapter 7. Waiting for Godot: The End of Evolution? Conclusion Notes Index About the Author Leonard Moss is professor emeritus of comparative literature at the State University of New York at Geneseo. He has served as editor of the journal of the Rhode Island Jewish Historical Association in Providence, and as Fulbright Professor of American Literature at the University of Athens and the Foreign Studies University in Beijing. Previous publications include Arthur Miller: The Excess of Heroism in Tragic Drama; and a memoir, China Was Paradise! China Was Hell!